The main things on my mind were balancing the flower and leaf colours over the whole piece, and what kind of dyeing technique to use to use to create the effects I wanted. 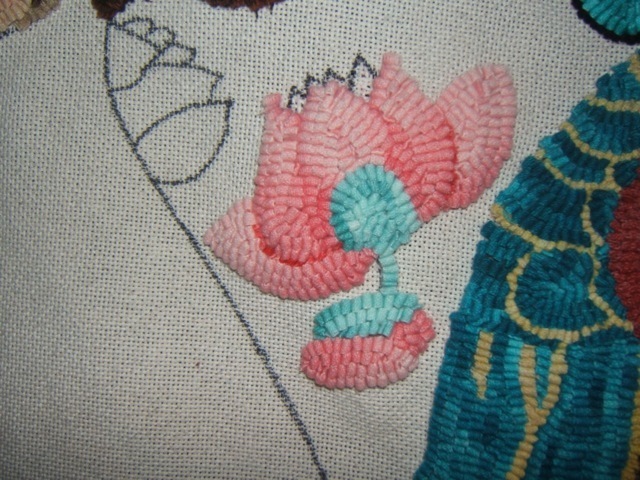 At the bottom right it was simple enough to use the dip dyed salmon for the large flower, but a dip dye wool wouldn’t work for the other flower on this stem. I ended up cutting the piece of wool the other way (dark end and light end), and using the darkest and lightest colours to create the frilled petals. The same problen arose with these flowers. The one on the left I did with 3 versions of pink sand, and I ended up with a pale blob of nothing. I thought at first I would just use one colour for the ones on the right…again…another ugly blob. I took that out, and at the point where I took this photo, I thought I’d try outlining in a darker colour, and filling in with a ligher version of the same wool….equally ugly. Frustrated, I went digging in my stash of red left overs. I found a 6 colour swatch in a colour that would work (an orange red). There was very little wool, but I managed to get enough. I did opposite petals the same colour, choosing two colours far enough apart in the swatch that they were easily distinguished. The petals are in the darkest green I have for this piece. I like the flowers, but worried that the whole area was too dark (being that it was beside the phoenix) I’ve decided to leave it though, since the background will be “yellow” and hopefully that will give a “spark” to this more intense area. So most of the left side is done, with the exception of my pink sand blob. I started ripping it out, but when I got this far, I realized that maybe there was hope for it yet. If the botton section of the flower became green, and the petals were subtly distinguished …..I’m still pondering this one! 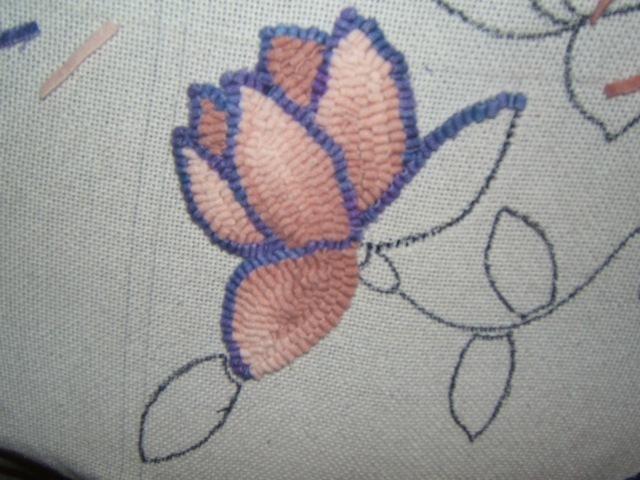 I did this flower with a paler salmon dip dye. The edges weren’t well enough delineated, so I inserted a wee strip of very dark salmon between the petals. I’m calling this a stylized water lily. 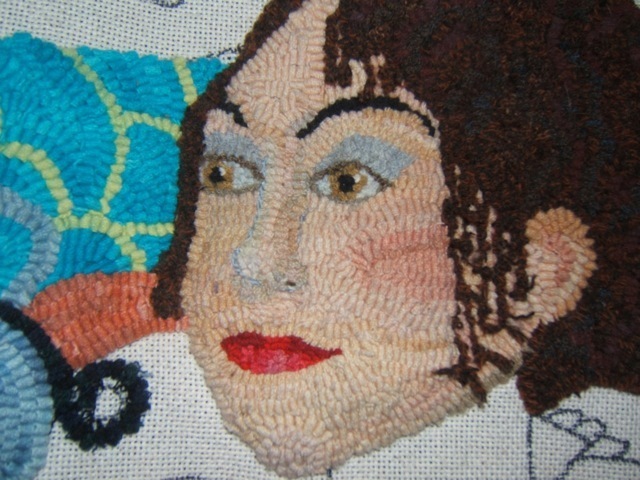 I copied Klimt’s use of black outlining for this and rather like it. It’s done in a paprika dip dye, and since it was outlined, I mostly used the dark part of the strips. Well that’s what I accomplished this week. I’m thinking ahead to the background. I know what kind of end result I want, but I haven’t yet decided how best to achieve it. 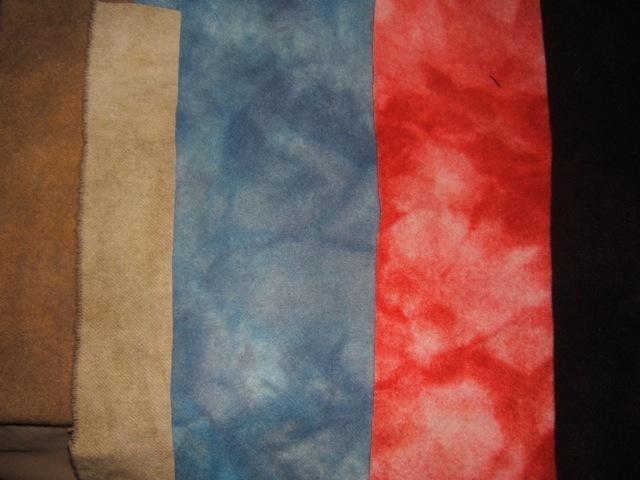 …..spot dye…..pancake dye….a variety of colours in individual pieces.?? 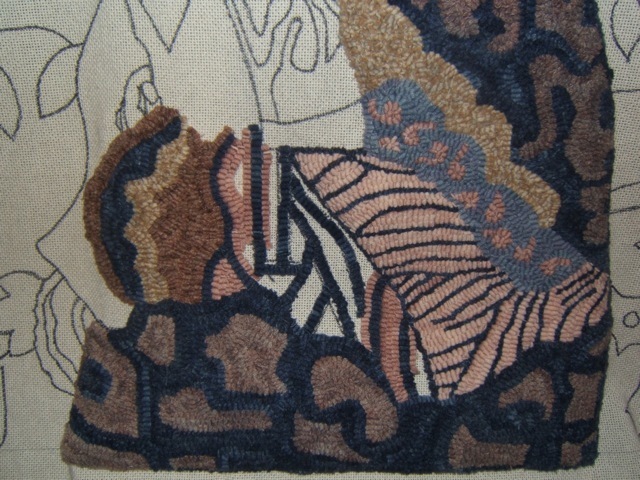 This morning Wanda Kerr has an article on wandering wool and how to dye it…a bit of a twist on what I’ve tried and I think it may be worth a try……There’s always something new to attempt…One of the reasons I love rug hooking. I’ll start at the end. This is what I’ve accomplished on Althea this week. 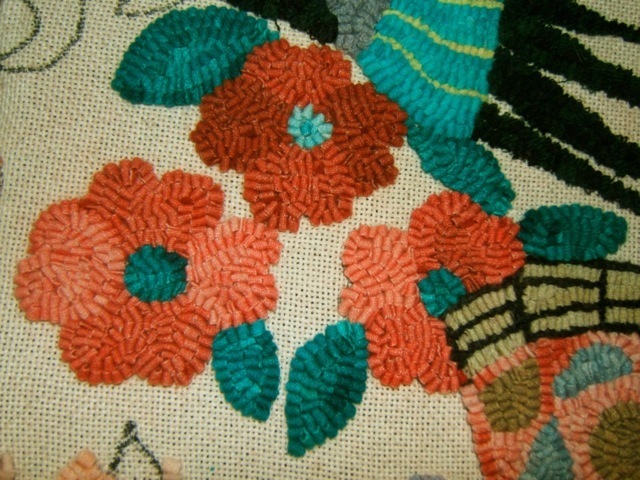 ….the fan, the kimono sleeve lining, the peacock, and two groups of flowers. As usual, it has been a process. some things work, and many more need rethinking or redoing along the way. This is the wool I used for the fan. All the colours except the dark one I have used in other places in the piece. I had the centre completed, when I realized that the triangle was in the wrong spot….so out it all came and was moved to the right and down. The dark colour is from a grey cashmere jacket that I had overdyed with navy and mahogany. I had originally intended to use it for Hygieia, but it wasn’t right there, but came in handy for here. The cashmere has lots of depth and richness (which you can’t really see in the photo). It’s also quite thick, and doesn’t fray when it’s cut in a very small strip, so it was easy to use for the outlining. 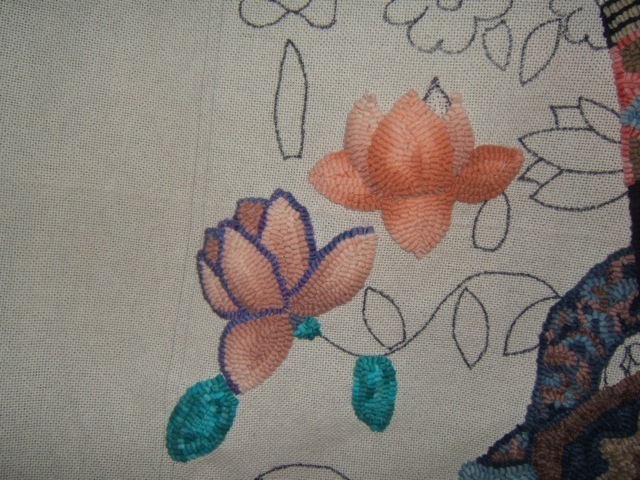 To hook the bit of the lining of the sleeve, I just used squiggles of many of the kimono colours. I’m calling this a peacock, although comments about the painting that I’ve read don’t mention what this bird is. 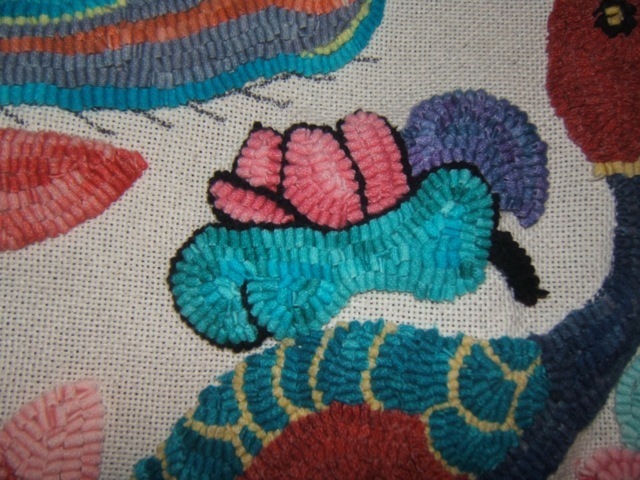 I hooked the back in ordered sequence (as you would for stained glass) in order to get the effect of the spotted wool. The breast is the same yellow that I overdyed with mallard green and used for the outlining on the phoenix. The head is a pale spot dye of Sea Breeze and Mallard green. My favourite part of this bird is his eye. His neck looks a bit too thick to me, so he may be in for a trim! The original painting has multitudinous colours of pink and red in the flowers, so I thought I’d introduce a new pink in the lotus flowers. 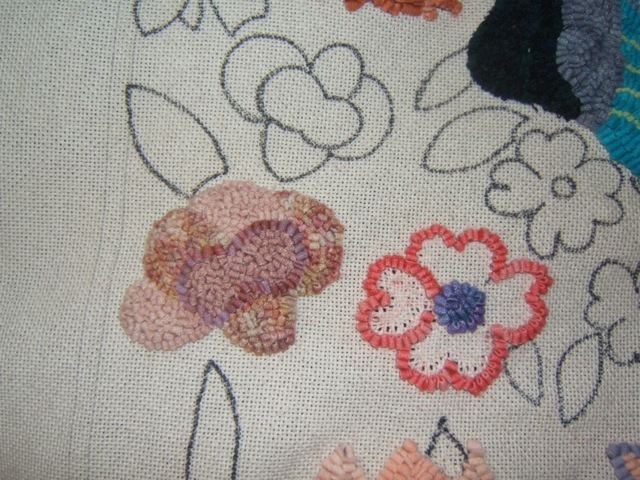 I spot dyed 1/8th yard with raspberry (and something else which I’ve forgotten). I hadn’t gone very far when I began to wonder about it. Actually I didn’t like any of it! Didn’t like the spot dye effect, and didn’t like the colour. When I got home from a hooking get together on Friday, and hung it up to take a look at the whole thing, I could hardly wait to get it pulled out! The colour has no connection with the rest of the piece at all. I decided to change tactics altogether, and dip dyed 2 1/16th yard pieces. This dip dye is Cantaloupe with a bit of Black to dull it down. The second is Cantaloupe by itself. I can’t believe how easy it was to do the dip dyes in the microwave. I actually did the dipping just on the kitchen counter (using boiling water as the only heat source) then when almost all the dye was taken up, I popped the whole thing in the microwave for 2 minutes, and it was done! I feel there is a cohesiveness to the colour palette now that really pleases me. I guess I did a lot of hooking yesterday. I was so anxious to see how the dip dyes would work. 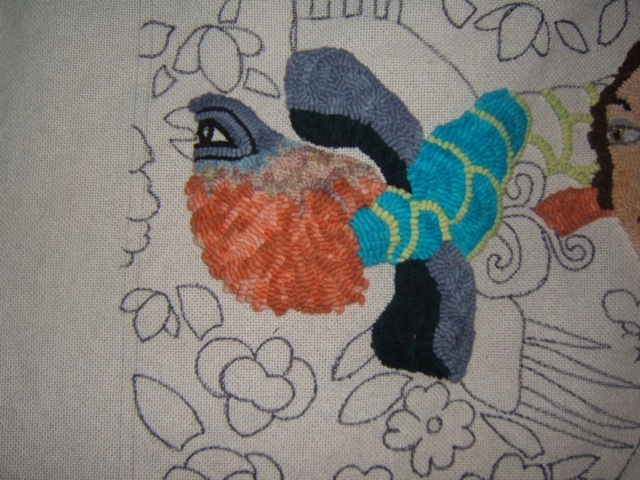 My wrist is a bit tender this morning so I’d better take it a bit slower….did I mention that I’m impatient? Every piece I do is a learning experience, and some “little girl” part of me gets excited whenever I figure out something new (for me) and like the results. This week has been one of those “aha” times. 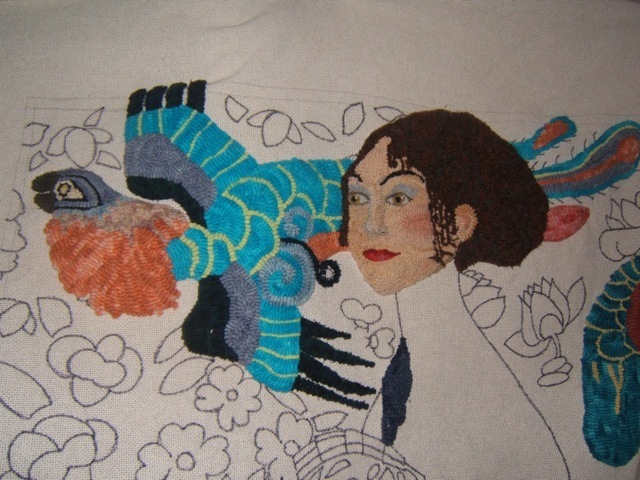 I ‘ve been hooking the kimono, and (as usual) struggling with the colours. At the end of the last blog, I mentioned that I was soaking some pale lilac wool to overdye. The results were pretty, but glaring against the other colours of the kimomo. Then Dorr came to my rescue. My 5 yards of natural arrived, and I was in 7th heaven. I have lots of recycled wool in my stash, and use it whenever I can, but I love nothing more than the feel and joy of hooking with freshly dyed new wool. I rationalize the expense by comparing it to the cost of buying wool dyed by someone else, and by resisting the urge to replace my Bliss and Frazer cutters with a Beeline or Ault. But I digress….I wanted some very pale pink, some shades of brown, and mauve and blue, and some very dark wool for the stripes. Everything I tried looked garish. 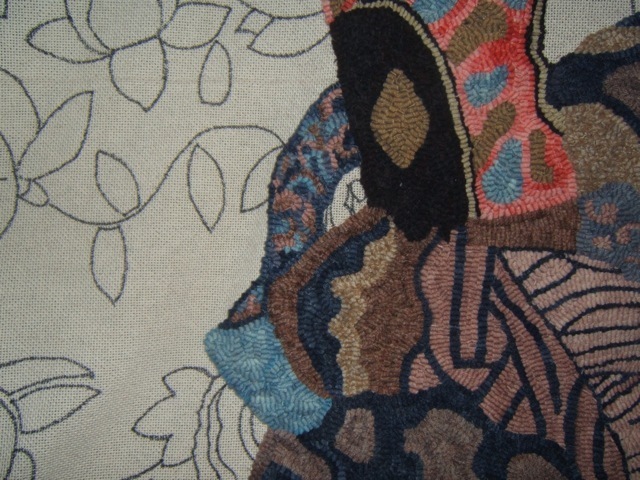 I liked the splotches at the bottom of the kimono, and had created them by dyeing mouse grey and pink sand over oatmeal wool. It dawned on me ( it should have occured to me sooner) to introduce at least one of these two colours in everything, and now I’m so pleased with the overall results. My aim is not to try and reproduce the original colours, but to achieve the essential overall effect. 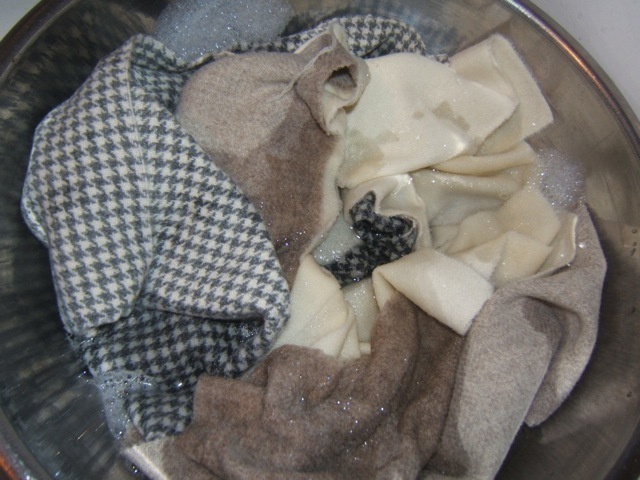 I overdyed the light brown houndstooth with mouse grey. 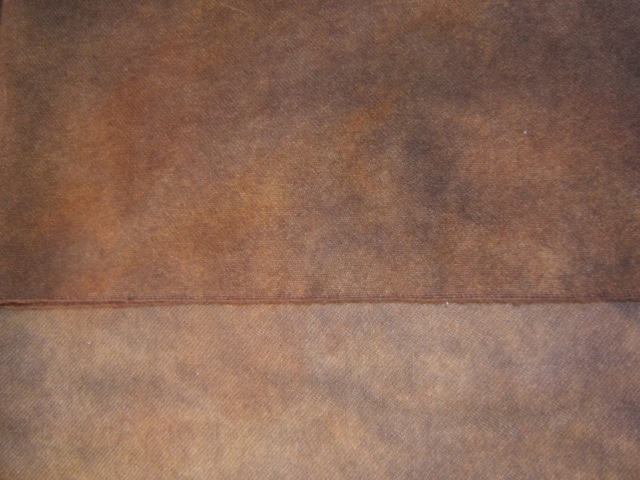 (the dyed piece is on the right). 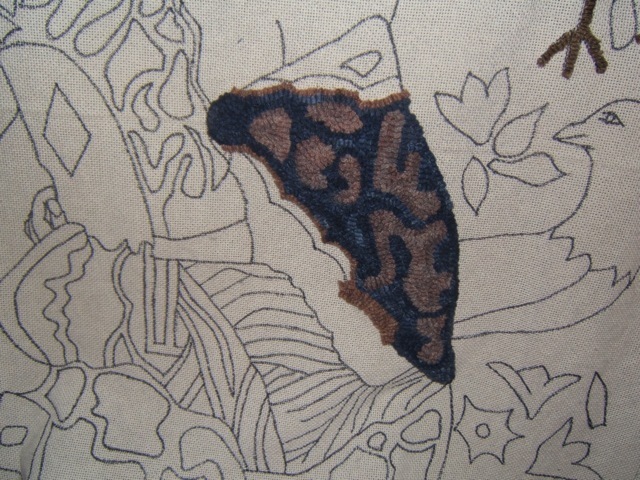 It looks splotchy and ungly in the piece, but suddenly “matched” the rest of the kimono. I did the same thing with maple sugar pieces and now they co-ordinate too. 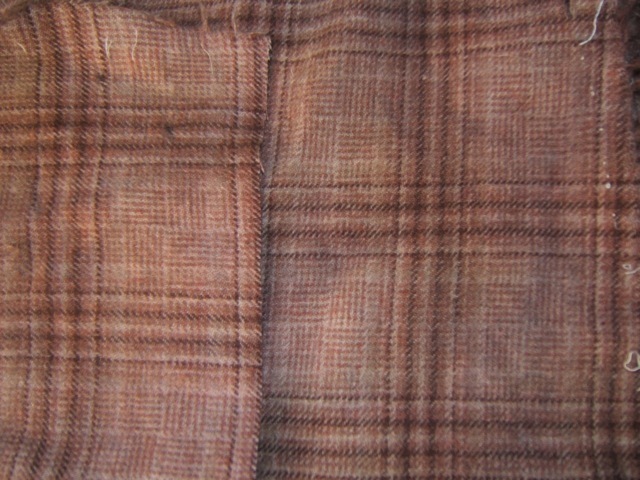 The pink plaid (overdyed with pink sand and mouse grey) was originally intended to be in the light part, but is now in the dark section. 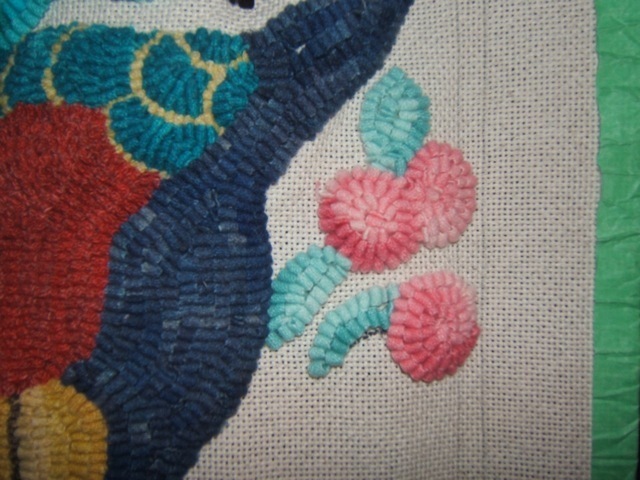 I used lazy swatches of pink sand for the pale colours, and my main deep blue for the stripes. Now I’m happy and can’t wait to finish this section. I think Althea is smiling too. My “Lady with Fan” is now Althea. Many thanks to my dear friend Sandi for researching names and finding just the right one. Althea means health and wellbeing…and this is my “healing piece”. I completely removed her left eye and rehooked it…changing it’s angle, lowering it, and enlarging the grey lid area. I like it much more now. The nose however, is another matter! I used some of the new dyes I purchased for this project in the Phoenix….Cantaloupe (with a wee touch of black to dull it a bit) and Sea Breeze for the body. 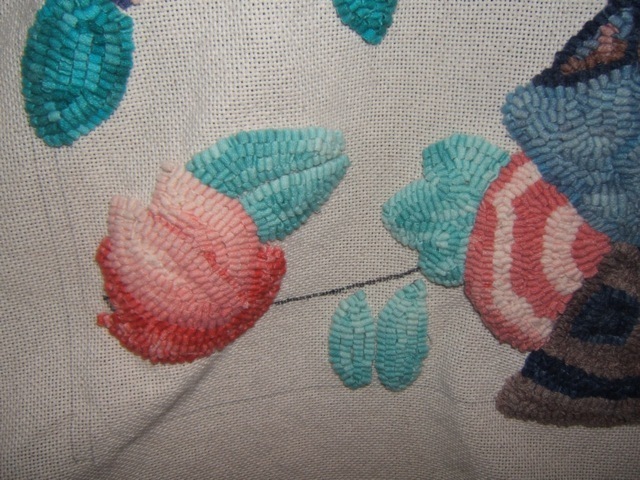 To get the pale yellow green for the tiny lines, I overdyed a piece of pale yellow with a smidgeon of Mallard green. Apparently all the greens in Chinese symbols are blue-greens (I’m learning something new every day as I work on this). I used my favourite black watch tartan for the “black” parts on the wings. I decided to move to the kimomo. My earlier attempt to dye the deep dull blue for it didn’t work. I used slate blue with a touch of lilac…it was lovely, and ended up on the Phoenix wings, but wasn’t at all right for the kimono. It needed more depth. This time I chose three different wools, natural, oatmeal, and a grey check. I dyed it with slate blue, navy, and a wee bit of blue violet. I had to do it twice to get the depth I wanted, but I really like the final outcome. For the lighter sections, I tried this sand/pink plaid. and some oatmeal wool. I dyed the oatmeal with pink sand and mouse grey (spotted, not mixed)…and I love that. My lovely pink plaid probably would have worked if I’d left it alone, but I overdyed it with pink sand and clay, and although i’ve tried it, it’s going to taken out….too red/brownish, and now too dark. I really like how the two wools go together. 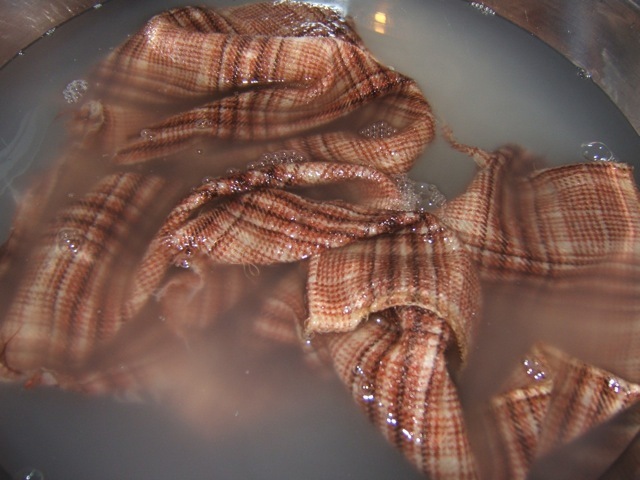 Right now I have some pale lilac wool soaking and I’m going to try overdyeing it shortly. ( keeping my fingers crossed). Dyeing wool is so exciting when it works, and so disappointing when it doesn’t. By the way…I’m so grateful to Wanda Kerr for her video on microwave dyeing. This rug needs lots of small pieces of wool, and it’s such a simple and quick method to do them, and to experiment without taking up the whole stove. I must make a trip to Goodwill to look for a better microwave dyeing container. My large ice cream tub isn’t very sturdy!